Our clients are global and now so are we! 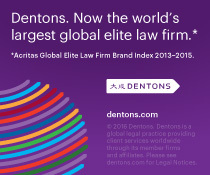 Dentons emerges from the merger of SNR Denton, Fraser Milner Casgrain LLP and Salans with 2,500 lawyers in 79 locations in 52 countries. For our mining clients this means improved access to the lawyers in many jurisdictions around the world including the financial centers of London and New York. We plan to expand our mining blog to cover many new topics from around the world in the numerous matters that affect our clients and friends wherever their activities and operations currently exist or take them in the future. Any questions, please call us.